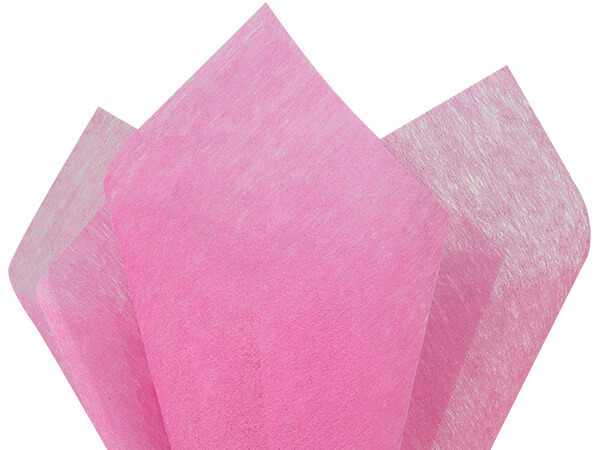 Hot Pink Non-Woven Tissue by the ream. Sheets look & feel like fabric but are strong polyester. Non-woven tissue is reusable and 100% Polyester. Our Non-Woven Fiber Spun Tissue makes beautiful wraps for flowers and gifts and can be used like regular tissue paper in bags. Sheets look & feel like fabric but contains strong polyester. Tissue doesn't rub or bleed and is water resistant. Non-woven tissue has more density than paper, so you will use less. Great for packaging on high end fragile products. Reusable!